The San Francisco Tweed Ride was this past Sunday. Melissa, of Bike Pretty, did an amazing job organizing the bike ride. There were over 60 riders and an awesome team of sponsors (PUBLIC Bikes, Tumbuk2, Ligne 8, Iladora, Relic Vintage, and Evgenia Lingerie) that each added an amazing element to the experience. My responsibility was to design a route that was safe, relaxing, and fun for everybody. This is an assessment of the risks that I took in the design process and how each of those risks panned out. Overall Melissa and I were very happy with the result. The outfits were great, the feedback from riders was overwhelmingly positive, and there were no injuries! I want to thank Melinda Greene for her help. She directed bike traffic at three turns along the ride, acted as a sweep when I was not, and helped me to track the metrics below. With a ride of this size it's essential to have somebody with Melinda's enthusiasm and knowledge helping out. I identified this segment (falsely) as the most dangerous section of the ride. It has three lanes of one-way traffic through San Francisco's notorious Tenderloin neighborhood. 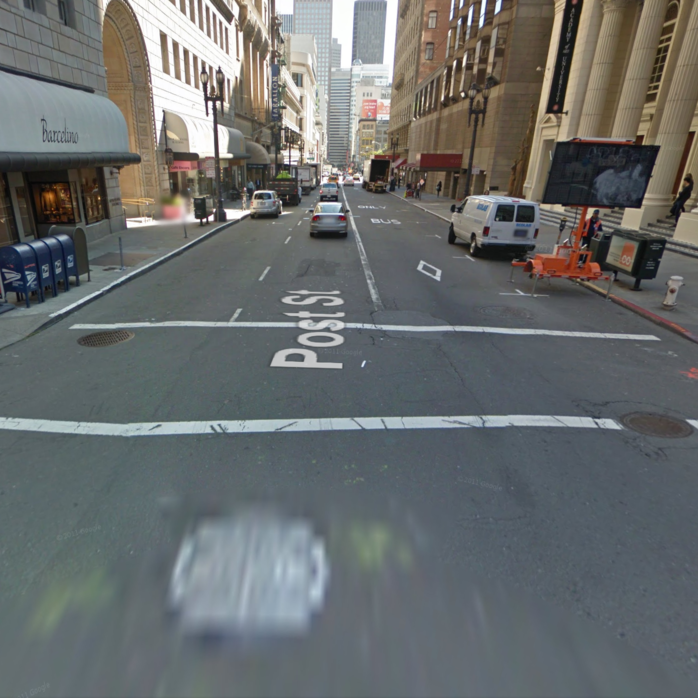 The Tenderloin is a hotspot for road injuries and fatalities. There were two major factors that countered the potential safety hazard. The first is that there is a dedicated bus lane on all 7 of the blocks I was worried about. Strangely, cars seemed to respect this lane and we would use it to provide safety. The second factor was the number of riders. There is a strong correlation between the number of bikers on the road and overall safety. While this correlation is not necessarily causation, it makes sense that 100 bikers are a lot more visible than one lone biker. This section turned out to be less dangerous than expected. At Mason St (ish) there was a pinch point involving a tour bus, but cars made sensible decisions and our group did a great job. Unfortunately we did slow down a Muni bus during this section, but it was only for a few blocks. Taking this route also allowed us to ride by Union Square. As planned, all the tourists whipped out their cameras to capture the moment. The Tweeders were delighted. Formerly known as "The Embarcadero Freeway", this road was once the site of San Francisco's most "Robert Mosian" highway. The highway was removed after it was damaged in the 1989 Loma Prieta Earthquake, but the Embarcadero today still carries plenty of car traffic. In particular, we had to grapple with 4 dangerous right hook hotspots with fast moving cars. In this case I was relying on my Bike Party experience with The Embarcadero to predict the outcome. When there are enough bikers we can simply clog up the right lane preventing any possible right hook scenarios and forcing car traffic to safely slow down near our group. This risk turned out to be the most dangerous section of the ride (and not Post St). Instead of filling the right motor vehicle lane as I had imagined, our group stuck to the bike lane and ceded the rest of the road to the death monsters. This caused two problems. First, giving cars the full width of the road allowed them to travel fast. Highway fast. And the risk of a fatality increases exponentially with speed. The second problem was a result of the first. Because we were all crammed into a 6 foot wide lane we were stretched out in a long line. This meant that the green phases of the traffic signals were a bit too short for the entire group to get through. This caused a group of about 10 people to fragment from the main ride for the entire section. While there were no collisions, the fragmented group was put into a low speed right hook scenario at the intersection with Harrison. In the future I will consider testing the separated path on the other side of The Embarcadero. The Loopback used for the final version of the approach. The approach to Iladora's studio near Potrero Hill turned out to be the most challenging aspect of the ride design. The roads nearby either had fast cars or dangerously bad pavement. I tested several options and had settled on a hilly, circuitous route that maximized safety at the cost of approachability. Then, the morning of the ride, I came up with a route that was tolerably safe and allowed us to avoid the hill. But there would be no time to test the change before the ride. As a rule, I NEVER take a group on a ride without testing every inch of it first. Melissa and I decided to go with the new route because we were familiar with the area from previous group rides. We also felt that the previously planned approach would be frustrating for riders and possibly lead to drop off. There were no observed safety issues and we were able to shave about 15 minutes off of the ride duration. But a small group at the back of the ride skipped the series of right hand turns I had planned. Instead they (safely) made a Copenhagen left from Division onto Bryant St. Right hook situations are common between 16th and 20th on Valencia St. Many cyclists I know avoid that section. This combined with high traffic levels on a Sunday afternoon placed Valencia high on my worries list. While I wasn't sure exactly what would happen on a Sunday afternoon, I do have several Friday night Bike Parties under my belt on Valencia St. I felt that we would be able to clog the lane and prevent any dangerous driving near the group. Valencia St, turned out to be the least stressful leg of the ride. We were able to clog up a full lane and prevent any dangerous driving near our group. On top of that, the reaction from people on the sidewalks was fantastic. As soon as we hit 16th tourists' cameras were out and bystanders were recording video of our stylish group.